Celebrate the achievements of graduates in your life with unique graduation gifts that can be personalised with ribbons to match their high school, college or university colours. 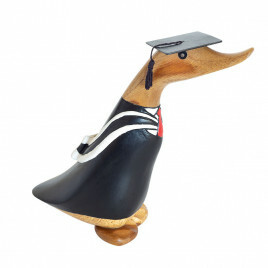 Whether choosing one of our clever little duckys in full mortar board cap and gown, a wise owl or a character duck matching their studies, we have a graduation gift to suit everyone and they are always dressed for the occasion. Add a personalised name tag, inspirational handwritten message or ask us to inscribe their graduation date to make a truly bespoke gift.